Ah, protected Boot Key Harbor, the home of so many for varying durations throughout the year. 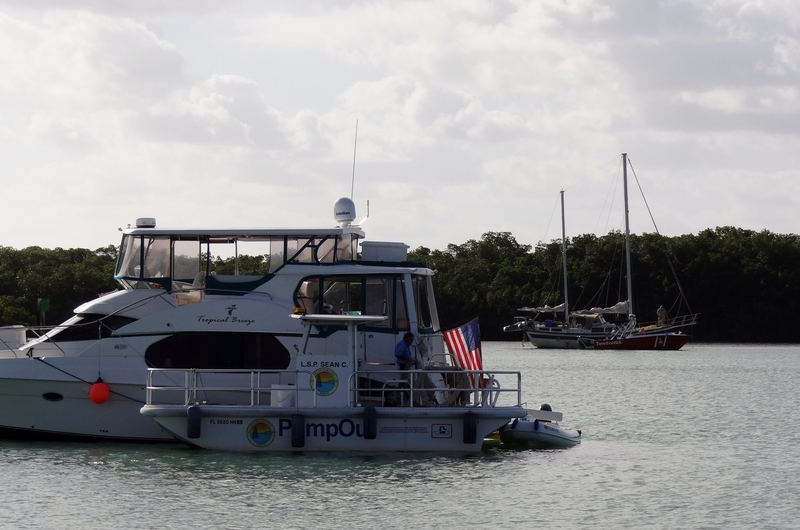 The Municipal Marina controls 229 mooring balls, all hurricane rated. The balls are regularly inspected and repaired as needed. A handout describes the three approved ways to attach your lines to the pennant. Picking up a mooring has become, dare I jinx things, a piece of cake for us ever since we acquired our super-duper stainless hook during our long stay here last Feb/March. After using the boat hook to pick up the pennant, being sure to reach through the dolphin strikers properly, I just clip the hook to the hard plastic eye of the pennant. The hook is attached to our anchor bridle which is attached to the cleats on the bows. Marinas don’t want you to use anything metal to attach yourself to the pennant, so we trade the bridle with the hook for lines that are fastened at the cleats and out to the eye of the pennant. From the time we arrived until Tuesday morning, the wind kept up its 15-22kts (never saw 30 though) and Russ was in regular communications with The Hearth, the hospital and then the convalescent/rehab facility, his brother, brother-in-law, the movers and no doubt a few others. Good thing we weren’t on the move. We hiked the mile to Publix a couple of times, picking up On Stranger Tides from the Blockbuster box. By Tuesday afternoon all our packages had arrived and Russ re-installed the port A/C circuit board to be sure it worked. All kinds of progress, except the reason we were here in the first place; the sail drive seal issue. No word. The other night I lamented the lack of photo opps. 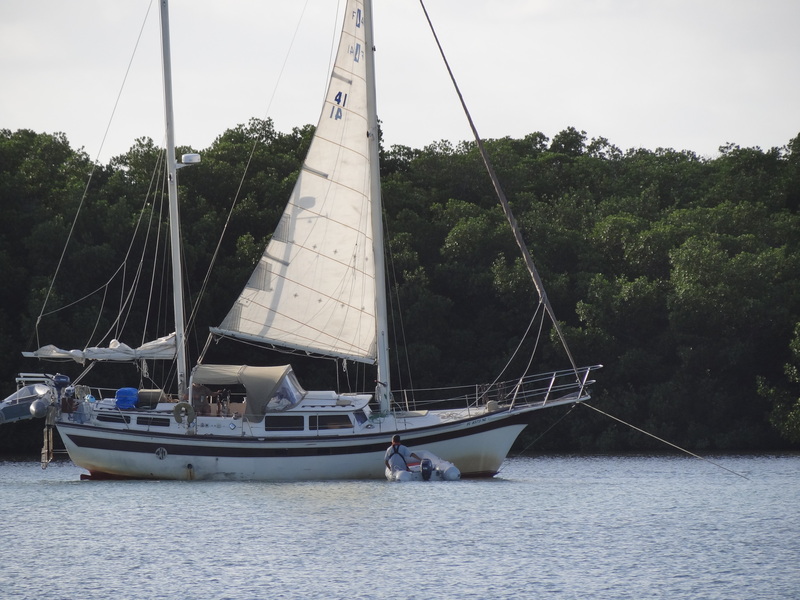 Well you know the saying, “be careful what you wish for”… the next morning we woke up to a 45ft monohull aground off the channel less than ½ a football field away. Am ashamed to say, I jumped right up to get a look and soon after, a photo. After trying to figure out how he got into that predicament we checked the tide to see that the grounding occurred near high tide. Several helpful boaters- or maybe they were just curious, went over to offer assistance, then left. I thought for sure I’d be taking another photo later on showing this guy way, way heeled over. But no, TowBoat U.S. showed up and got him free- not completely free- you can bet it cost-ed; oh, maybe like most monohulls he had unlimited towing! The dolphins have stayed away, although I saw an amazing sight about 80 ft off our stern; a stingray jumped out of the water, twice. I don’t think anything was chasing him, so perhaps he was after a tasty lunch. The water is 8 ft deep and a milky green. At best you can see down about 3 ft but the sun was at an angle such that I could see him in the water; nothing was chasing this guy. With life a bit boring right now, we’ve resorted to dinghy watching. 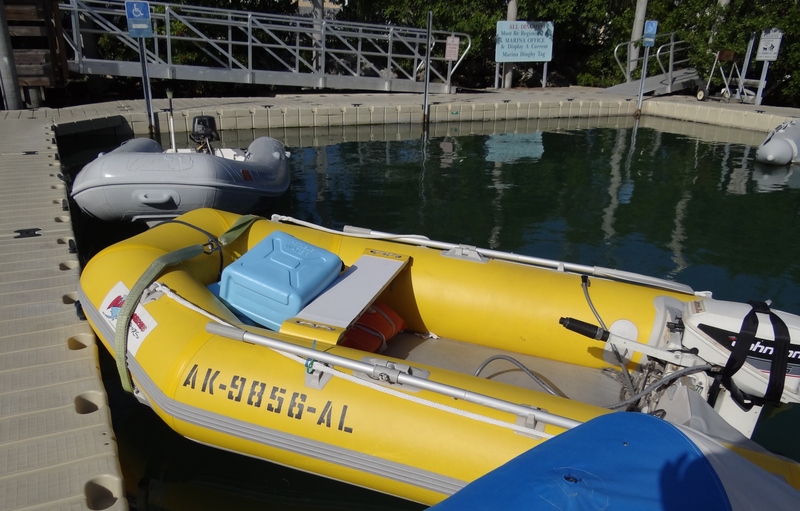 I think most people know that the most common color for inflatable dinghies is dull and boring gray, gray or even gray. Imagine seeing a bright yellow one! We’d just gotten out of ours at the dock when the owner of Sunshine Yellow comes along, “nice dinghy chaps.” I have to confess that all the work was worth it for those things because they are a great conversation piece. Decent job in sun protection too. Will they protect the dinghy itself from the dangers of a crazy driver or a marine bivalve-covered pier remains to be seen; or not. We chat about his and ours. His being an Alaska model with a special gray material along the rub rail and covering the underside. The elements being a tad tougher in Alaska gives companies a reason to develop better materials and construction methods. This particular dinghy was the owner’s second one, the first came apart. Why ? I’ll give you a clue. Heat. The glue that worked so well in chilly Alaska fell apart in Florida. The replacement is a test model of sorts to see if the re-formulated glue holds up. Read some bummer news on the CruisersForum the other day that Bob Bitchin’ has sold Lats & Atts to SFO (whatever that is); Stocks, Futures and Options came up on Google, but how about San Francisco Offshore? or Sailing Fun Obsession. The sale was announced at the recent St. Pete Boat Show. Bob is a one-of-a kind guy with a life many adventurous folk would envy. May he remain involved with the mag for at least three more years… until our just renewed subscription runs out! This entry was posted in Uncategorized and tagged Dinghy, Lats&Atts. Bookmark the permalink.